This sounds like an excellent plan to me. I wish every city in SC had one of these guys. As long as I'm wishing, I wish that SC would just change its annexation laws. Back when I lived in Cola, they had an Annexation coordinator. Her name was Shirley Gossett. She took a different position with the city and I guess the position was eliminated at that time. Given the screw-ups the city of Cola has had lately, it will be even tougher to get areas annexed. By screw-ups, I mean the Empowerment Zone fiasco, Convention Center Hotel debacle etc. Maybe if Coble retires/get defeated, it would help in that regard. Florence has annexed considerably more land since getting the sales tax, but it has mostly been developers getting new subdivisions annexed as the streets start going in. Some existing homes have requested annexation, but not an overwhelming number. Charleston county municipalities are about the only ones that have had great success with significant population growth through annexation. As an example of the difference between NC and SC on annexation, I am adding this info that I saw on another thread. Fayetteville NC (population 125,000) city council just voted to annex 43,000 residents. It only required a vote of city council. Someone in the Fayetteville thread posted the annexation failed. We should start a thread on the empowerment zones. That Rosewood group is unbelieveable..they want Fairfield County to give them money after losing $250k of Columbia's money. A city councilman was quoted as saying Fairfield should give money to them so they can pay Columbia back. He must be crazy to say that in the press..does he think Fairfield residents really wants to give money to a private concern so they can repay Columbia? I can't believe they were paying kids to visit these kid's centers. I'm all for helping the disadvantaged. But the legislation allowing some of the more successful businesses in town to recieve money intended for job growth in poor areas is severely flawed. I wonder if the annexation laws were changed after Columbiana was stolen from Irmo? For those not familiar with this, in the ealy 90s the City of Columbia annexed the Mall in a surprise move. Irmo had thought tax revenue from the new mall would come to their town. Columbia used a string of contiguous parcels out along the river and across I26 to annex the Mall. FOr many years afterwards Lexington politicians hated and mistrusted the politicos on the Columbia side of the river. It was only with a lot of lobbying that Lexington County went along with the Convention Center hotel tax. To this day Richland and Lexington county officials still compare and contrast the county, the services and county officials with each other. Thanks for the update on Fayetteville, I noticed that earlier today as well. However, it may resurface and just shows how relatively easy it is in NC. As for your other point, the answer is no. The annexation laws have not been changed significantly in decades, which is why city populations have not changed significantly in decades. My aforementioned Charleston county exceptions notwithstanding. Yeah I remember when Columbia strong armed poor little ole Irmo for the Mall, hell Columbia has all the major ones don't they Columbiana, Richland, Dutch Square, is Columbia Place in the city limit too? Or mabye Dutch Square is just out of the vicinity or is it both? I think they are all within the city limits of Columbia. I know Dutch Square is. Actually NONE of them were when Columbiana was annexed. Richland Mall is in Forest Acres. Columbia Place (called Columbia Mall then) was and still is in unincorporated Richland county. Dutch Square was too back then. It has since been annexed. The city pretty much required it when they did there major renovation a few years back. Only Woodhill Mall (which I think was renamed since then) was in the city limits. Woodhill was not doing too well back then either. I take the opposing view that Columbia was within it's rights to annex the mall. The mall needed police protection that Columbia could provide, plus since Cola already provided water and sewer to the area, the mall would see a reduction in those rates with annexation. The mall may have felt coerced to annex by the city, but if the city hadn't expanded it's water and sewer lines to the area, the site couldn't have supported a mall (or any development really) in the first place. The only way Cola could have stolen an area from Irmo is if the area had already been in Irmo's limits, which could never happen. Lots of folks in Irmo would disagree vehemently, but thats my take on it. Cola could have handled the situation more diplomatically though. I remember for about a month or so back then, Irmo claimed they had annexed the mall, then Columbia said nope we annexed the mall, this went back and forth. I grew up one exit down from the mall on Piney Grove Road (Richland side), so I was all for seeing Columbia strong-arm Irmo. Back then i didn't want to see Lexington County outshine Richland. But I guess that's funny now b/c I believe part of Irmo is in Richland County, same with Columbia now as well. But that was my twisted youth. I threw this together in kind of a hurry, so I aopologize for the low quality. I mapped the city's in the area, and I took out the Census Defined Areas, but left their labels for reference. The green stars are the malls. 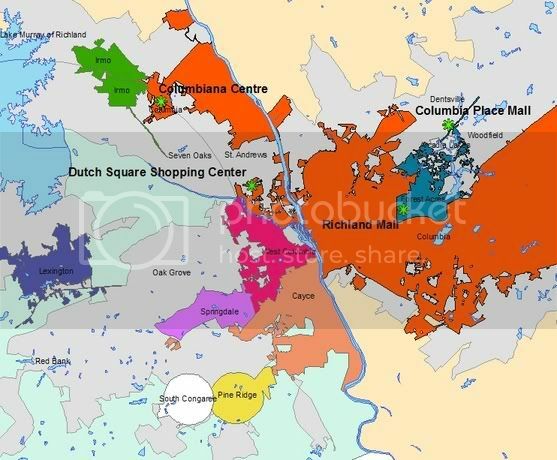 Columbiana and Dutch Square are in Columbia, Richland is in Forest Acres and Columbia Place is unincorporated, although it is alot close to Forest Acres than I previously thought. Grey areas are Urbanized areas. I note Woodhill Mall seems to be packed when I ride by these days. All the new shops seem to have a lot of business. It's basically a brand new mall. In the Irmo vs. Columbia battle over Columbiana Center, at the time Irmo did have a good police force.. modernized under Chief Ray Nash..an old friend who is now Sheriff in Dorchester County. I agree that is makes sense for Columbia to mandate annexation to access city water. But the way they did it left all those in Lexington counting on the tax revenue feeling completely screwed by the city of Columbia. The fallout from the way it was done still hurts the area. Instead of working together the counties still squabble over water & sewer rights in the COG committees. Who has what treatment capacities, etc. Nice map Spartan.Note that Forest Acres is very agressive in growing their city. They go door to door occasionally asking people to consider annexing into the city. From the Keenan area all down Two Notch to the Mall and down Decker and Trenholm. They've been working on those areas. Seems like their are signs down Two Notch about you are entering Forest Acres, etc. They too have a strip of land running down the CSX tracks from Leaside Rd southwest of the mall all the way out to 277. They think big. Once the new sales tax goes into effect, expect to see Forest Acres expand even faster. Undoubtedly they will try to annex Columbia Place. The sales tax will lower property taxes making it even easier to convince citizens and business owners to sign. Already much of the downtown office space has migrated to cheaper Forest Acres. Years ago Forest Acres Police seemed to exist solely to harass young long haired kids like myself. But I've got to admit they seem to be a very professional force these days and it is worth considering annexation. They have a high profile and respond quickly. In dealing with the sheriff and police on that side of town it's rare to have 1) the police repond and 2) response within two hours. Man FA has grown abit since I last ventured there its almost in Dentsville. What's the pop. estimate now? Maybe so, but it can be done much more easily than in SC. If you look at the city limits of any city in NC, they often go out to areas that are non-urban. The cities in SC rarely do that, and if htey do it is only for a very very small area. Very true. Infact, Spartanburg will be adding its largest tract of land in about 10 years coming up soon: about 20acres. My understanding is that legally annexation is very easy in NC, but politically, it can be difficult. I'm not sure if it is this way with every city, regardless of size, but I know the larger cities pretty much annex at will. Charlotte has annexed large areas without interruption for decades. It is expected that if you live in Mecklenburg County, you will eventually be annexed by CHarlotte or one of the other cities. All of the cities in Meck. have divided up the county so as not to compete for territory. State law requires that certain density requirements be met before annexation can proceed. Also, the annexing city must have a plan in place to provide the services to the area involved. That can often be a "hang-up" as the expenses of that are largely all up-front but the taxes to pay for it come in over a long number of years. The other "hang-up" is that often the city council doesn't have the political will to do it. The newly-annexed or proposed to be annexed area, raises a fuss to such a degree, that the council backs off. I think because Charlotte long ago set the expectation of eventual annexation, and hasn't wavered from it, the opposition there has never really been effective. Additionally, NC also allows satelite (non-contiuous) annexation. SC does not. There really is no comparision between the two states in terms of their annexation laws. Greenville and Spartanburg have gone decades without a significant annexation. What little there has been has been commercial areas, enticed with water service or Sunday liquor licenses. Actually, I think Columbia was right in annexing that land. The most important thing for the entire region is for the central city to be strong. People that live in the suburbs do NOTHING to contribute to the city, but they benefit immensely from what Columbia has to offer. I would be in favor of a Columbia-Richland County consolidation, much like what was done in Jacksonville and Nashville. Wlcome to the forum waccamatt! I would not be infavor of that. The requirements of consilidation would be tremndous. The Lower Richland area is like another world, and the services that would need to be provided would be a major task. I just want the city limits to accurately represent the urbanized area of Columbia. Consolidation does not mean that all city services are extended throughout the entire city/county. There are plenty of areas in Jacksonville/Duval County that don't have sewer service for example. Rural areas like Lower Richland exist in Jacksonville. Everyone is taxed for countywide costs, such as courts, sheriff, public buildings, etc. If you receive water and sewer, you pay for those through your monthly utility bills. It really works pretty well. In Jacksonville, 70-75% of the entire metro population is under one government. It's a lot easier to approve, pay for and accomplish anything. A lot of duplication is eliminated. Instead of Columbia having a Police Chief and Richland County having a Sheriff, there would just be a sheriff. Same thing for Fire Chief, Water Plant Manager, Sewer Plant manager.etc. More importantly, a lot of controversy and conflict is avoided. No annexation wars, no trying to get two governing boards to agree to the same thing, developers can't play one government against the other, etc. In Jacksonville, if the Mayor and 10 (of 19) councilmen sign on, it happens. There's no getting the city to approve it, get county council to approve it, get Lexington Co/Cayce/ West Columbia to approve it. Also, in order for suburbanites to avoid the true cost of local urban government, they have to move out of the entire county. Just moving from say Shandon, to Forest Acres or Richland Northeast would change nothing. They would have to move to Kershaw or Lexington County. From what I know of Nashville (which isn't as much), Nashville has an "Urban Services" boundary within which everyone pays higher taxes to support the full level of urban services. It does not include all of Davidson County. Residents of Nashville/Davidson outside of urban services are only taxed for the services they actually receive. Consolidation is a bold and progressive step that usually only happens when pressure to do so comes from the local residents. Consolidation reduces the number of elected officials, so they usually serve their own selfish interests and fight such efforts. Politicians rarely give up their power voluntarily. Both Charleston and Columbia have proposed consolidation in the past, but it has never gotten beyond a study phase in Columbia. I THINK Charleston voted on it back in the early 70's but it failed. Can anyone confirm that? If any city/county approves consolidation in South Carolina, my guess would be Sumter would be the first. Georgia has quite a few consolidated governments, Columbus/Muskogee, Athens/Clarke, Augusta/Richmond. I'm not sure about Savannah/Chatham.